Overall Influencer Marketing attracted a lot of attention in 2018 for some good and not so good reasons. Luckily, most of those unfavorable reasons were in the B2C space. Within the B2B marketing world, influencer marketing has made many advancements and more organizations are evolving their testing, use and sophistication of the practice. 1. Micro AND Macro influencers. A lot of marketing press has emphasized micro and even “nano” influencers over celebrities. There’s merit to that but in B2B, the tier one influencers are still important. Successful programs incorporate top influencers that have large, relevant networks with more niche influencers with high engagement. When mapped to the right kind of content in the buying journey, a mix of influencer types is very powerful for B2B marketing. 2. Centralizing Influencer Operations. Many B2B companies have experimented with influencer marketing within different regions and business units. Disparate processes and lack of coordination can create real problems along with inefficiencies. Centralizing influencer marketing creates an opportunity to strategically benefit from the role of influencers across multiple departments of a company in a way that is both efficient and effective. 3. Always On Influencer Engagement. At earlier stages of maturity, many B2B brands are campaign focused when working with influencers and interactions are only when the brand needs something. More advanced B2B marketers are running always on influencer programs where there is a focus on developing alignment, relationships and advocacy. Campaign and event involvement plays a role vs. being the only outcome. 4. Focus on Quality vs. Quantity Metrics. From influencer identification emphasizing topic relevance and alignment with the brand vs. popularity to impact metrics evolving from social share counts to leads generated, there’s a big shift happening in the way qualitative metrics are used when running influencer marketing programs. 5. Influencer Marketing Software Investment. Less sophisticated influencer marketing doesn’t require more than a spreadsheet, email and a few tools to find influencers. But as B2B organizations start to implement influencer marketing across departments and businesses, coordination of influencer identification, engagement and program measurement requires platform investment. Influencer marketing platforms can provide an easy way for different departments in the same company to find, engage and activate influencers across a variety of programs as well as manage communications and measure performance. Don’t rely on popularity metrics alone to decide who will be the right influencer or on the opinion of your marketing team alone to decide which influencers to work with. Relevance, resonance and reach metrics should be used for influencer identification and validation. Don’t wait until you need an influencer to reach out. The time to raise an army is not the first day of the war so the time to recruit influencers is long before you need them. Start the romance early by following, engaging, commenting and reaching out in a way that adds value. When the time comes, the relationship you’ve developed will make it much more likely the influencer will say yes. Do your homework on the influencer. Understand their expertise, their voice, content preferences and approach. Also look for signals that reflect engagement opportunities like interest in speaking at events, being an author, getting media exposure or access to brand experts. Do match influencer type and topic of relevance to the appropriate content. Beyond the basics like ensuring an influencer who creates video is engaged to create video (instead of publishing a blog post), match famous influencers (aka brandividuals) with top of funnel awareness content. Similarly, match niche influencers, like customers or advocates with end of funnel content. There you have it: B2B influencer marketing trends and tips all in the same blog post! There’s a time and place to work with famous influencers, but B2B brands that are working on making their influencer marketing more effective through centralizing operations, focusing on quality and investing in software, will find that working with a greater number of niche influencers with higher engagement and brand affinity will produce better results. Be sure to check out our influencer marketing services and case studies too. 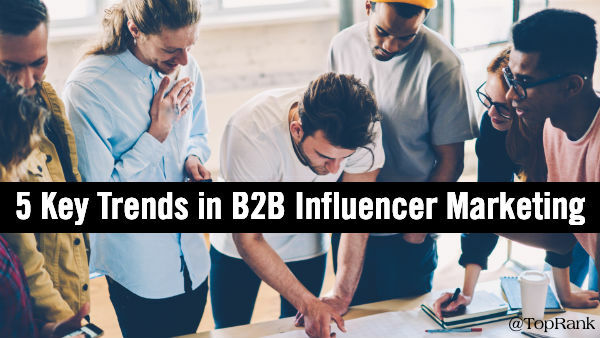 The post 5 Key Trends in B2B Influencer Marketing Plus Critical Do’s and Dont’s appeared first on Online Marketing Blog – TopRank®.